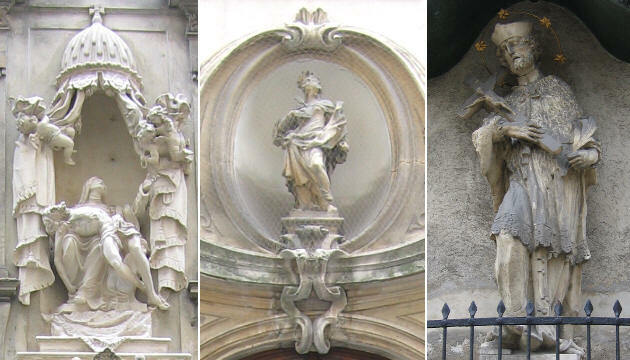 The strict association between the Habsburgs' Empire and the Catholic faith shows up in Vienna also in the large number of sacred images on private buildings. The owners of these buildings showed not only their faith, but also their loyalty to the emperor. As one would expect statues and reliefs showing the Virgin Mary by far exceed those portraying other saints or holy symbols. There are however few madonnas, by this meaning the Virgin Mary with the Infant Jesus, while Rome is full of madonnelle. 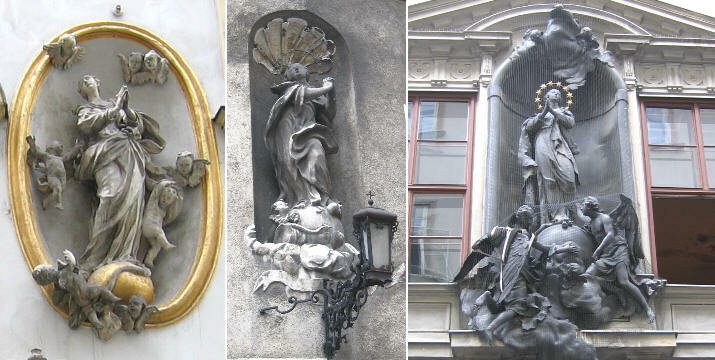 In Vienna the most frequent iconography of the Virgin Mary is that which makes reference to her immaculate conception. She stands over the globe (sometimes a moon crescent), crushing with her foot a snake which represents the original sin. She is usually crowned by twelve stars, a reference to a sentence in St. John's Gospel or to the twelve apostles. St. John Nepomuk stands out as a preferred subject among the sacred images not dedicated to the Virgin Mary. This saint in the XVIIIth century was the object of a particularly strong devotion, especially in Prague. The use of stucco allowed for a very elaborate design and decoration of many sacred images (the image used as a background for this page shows the stucco decoration of a sacred image in Palazzo Panfilio in Rome). Many of the ordinary houses built in the XVIIIth century in new settlements outside the walls do not exist any longer, replaced by larger buildings. The remaining ones often show a very elaborate stucco decoration having a religious subject.